Firefighters embrace near the scene of a shooting that killed Capt. David Rosa on June 25, 2018. Photo by Thomas R. Cordova. 2018 was a busy year. From losing things—such as Community Hospital in East Long Beach—to gaining things, including a glut of new buildings in Downtown, the city underwent significant change. Long Beach also mourned with its fire department after the death of Capt. David Rosa, who was shot while responding to a call on June 25. It was the first on-duty death of a firefighter since 1974. Construction of the new Main Library on Pacific Avenue and Broadway. Photo by Brian Addison. Whether you call it gentrification or progress, there can be no doubt that the city’s core is undergoing a historic change. At a meeting in August, Mayor Robert Garcia extolled several projects underway or in the planning stages, including the $195 million Broadway Block project, a 750-unit residential building at One Golden Shore Avenue and the Shoreline Gateway Tower. 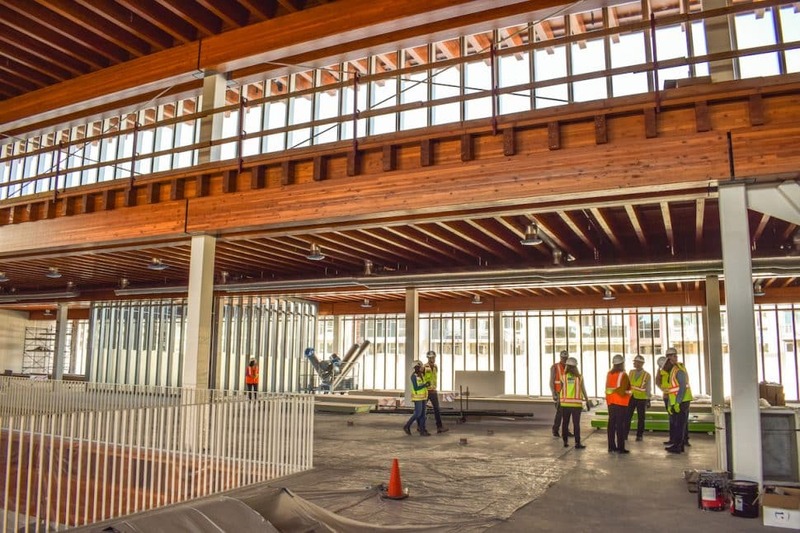 This is in addition to the construction, expected to be complete in 2019, of a new $600 million Civic Center and 92,500-square-foot Main Library. At his state of the city address in January, Garcia touted $3 billion worth of construction underway throughout the city. Protesters chant in front of the Long Beach Police Department headquarters after marching from City Hall to protest police use of Tiger Text, Tuesday, September 25, 2018. File photo by Kelly Smiley. The Long Beach Police Department found itself under intense scrutiny in September after an investigation by the news organization Al Jazeera showed some officers had been communicating potentially sensitive information on a phone application that automatically deletes messages. The application Tiger Text was installed on 145 of 291 city-issued police phones in 2014. Defense attorneys and legal experts said the app could shield the messages from being turned over to opposing attorneys in legal cases or being produced in response to public information requests. The development sparked a protest at City Hall, and the City Council authorized an outside review as to whether this was improper. The review, released in December by a firm that has represented the city in the past, showed that Tiger Text complied with state law. Separately, the Post published an investigation in October showing that officers in the local department are almost never interviewed after they’ve shot someone—contrary to practices in every other city with its own police agency in Los Angeles County. The department released a response to the report, disputing that this practice is improper. They said in part that officers are allowed to provide a voluntary written statement in lieu of an oral interview. lauren woods’, American MONUMENT, on display at the University Art Museum in Long Beach, Sunday, September 16, 2018. Photo taken before the project was paused. Photo by Kelly Smiley. 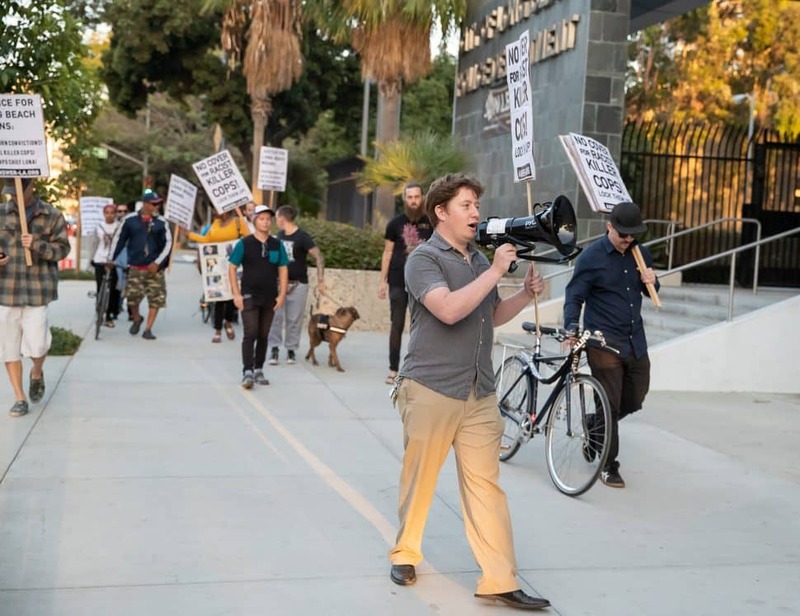 Just days before the September opening of a controversial exhibit surrounding police brutality, a dean at Cal State Long Beach abruptly fired the director of the University Art Museum. The story gained national attention as rumors swirled that the firing of Kimberli Meyer was related to the exhibit, which included a sound installation with recordings of dialogue from case testimonies of African-Americans who had been killed by police. 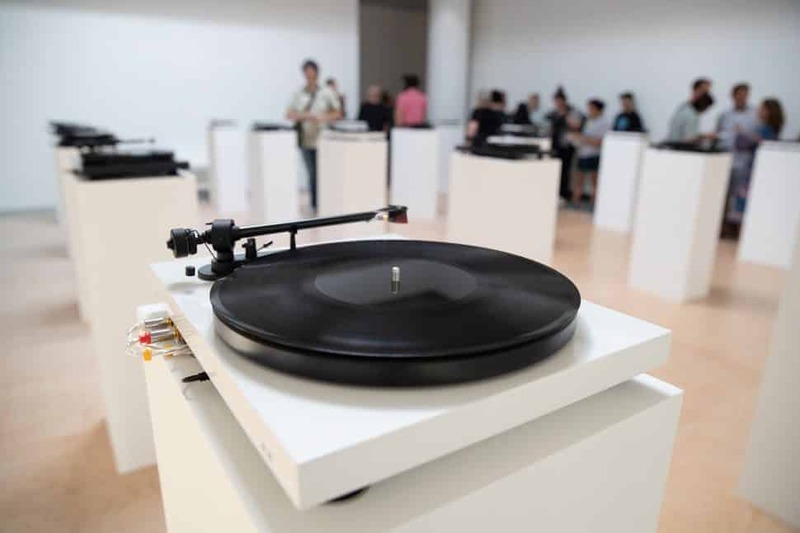 In protest of the firing, the artist behind the exhibit, lauren woods, walked out on opening night and decided to turn off the record players, effectively shutting down the exhibit. More information came to light, however, disputing that the dismissal was related to the exhibit—an assertion the university denied. A union official provided an email to the Post showing Meyer wanted staff to handle feedback about the exhibit based on their own race and the race of those offering their concerns. The official also raised other concerns about Meyer’s management of the museum. 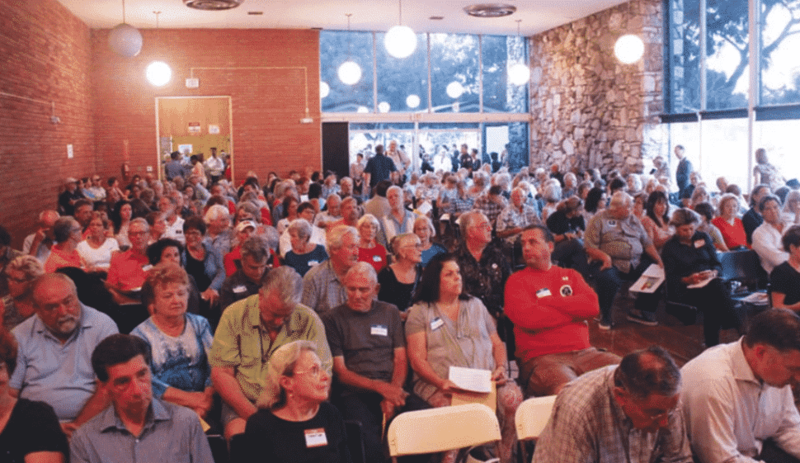 Community members pack a community center at Whaley Park in October 2017 during meetings over the Land Use Element. File photo. In an effort to update zoning designations across the city—and also in response to reports showing a dire need for housing in Long Beach—city officials in 2017 released a plan called the Land Use Element that led to protests, contentious meetings and significant changes ahead of the April 2018 election. The plan fueled outrage among some residents, particularly in the more suburban East Long Beach, as it would have allowed for taller buildings and more dense neighborhoods. The City Council in March 2018 ultimately approved a slimmed down version of the Land Use Element, bending to many residents’ concerns. Staff at the time warned that the city will be behind in its housing goals, as nearly 800 acres of density were wiped off the original maps. Following a horrific shooting at a high school in Parkland, Florida, that left 17 people dead on Feb. 14, local students were on edge after a series of arrests and threats in Long Beach. A Millikan High student was arrested Feb. 21 after classmates reported overhearing him threaten to harm others at school. That same day, police stepped up security at Poly High after a threat of violence on social media. On Feb. 23, police arrested a 16-year-old junior at Wilson High on suspicion of making threats, and the following day police arrested an eighth-grader at Tincher Preparatory School for the same reason. The community came together on March 24, when student youth organized March For Our Lives rallies across the country, in part calling for legislation to prevent gun violence. The local event at Bixby Park drew thousands. After haggling for years over how and whether to allow sales of medicinal marijuana—an issue that was finally resolved through a citizen initiative at the ballot box in 2016—Long Beach leaders responded relatively quickly to a statewide measure allowing sales of the drug to anyone over 21. In July, the City Council passed a local ordinance that allows recreational sales, but requires dispensaries to co-locate with medicinal operations, and meet a raft of requirements. The first four recreational dispensaries opened on Aug. 31, and about eight more shops opened in the ensuing months. The total number that will be allowed is 32. 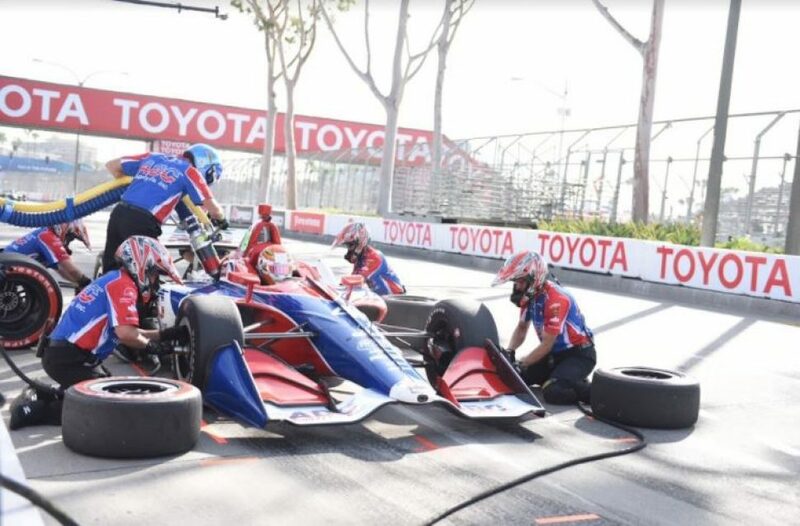 Among the longest-running sponsorships for any sporting event, Toyota and the Grand Prix of Long Beach have been partners in hosting the city’s largest event for more than 39 years. In August, race officials announced that the carmaker would not renew its sponsorship of the local IndyCar race, which rumbles through the streets of Downtown each April and draws an estimated 170,000 spectators over three days. Grand Prix officials have been working to secure another sponsorship, though no announcements have yet been made. This year’s race is slated for April 12-14. Citizens line up to speak at City Hall during a discussion of proposed charter amendments, which the City Council placed on the November ballot. Long Beach August 7, 2018. Photo by Thomas R. Cordova. 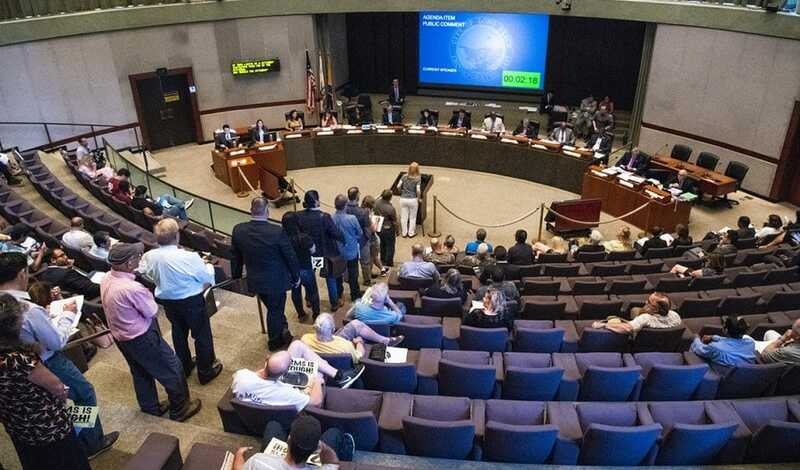 Mayor Robert Garcia and City Auditor Laura Doud threw their political weight behind four changes to the city charter, which guides how the local government runs. Voters handed them a resounding victory on Nov. 6. The most controversial of the measures will change term limits of the mayor and council, allowing them three, four-year terms instead of two; it also eliminates the ability to run as a write-in candidate. Voters also agreed to give the city auditor power to conduct performance audits and established an Ethics Commission and Redistricting Commission ahead of the 2020 census. Separately, voters passed a measure that adds protections for hotel workers in the city. Voters in April and June also re-elected the mayor and all incumbent City Council members in odd-numbered districts. Changes, however, are coming to the way city conducts elections in the future: Thanks to a new state law, the city may have to align future contests with the state primary or general election in November, a move aimed at boosting turnout. Closure signs posted out front of Community Medical Center Long Beach in Long Beach June 13, 2018. File photo by Thomas R. Cordova. In April, the city was caught off guard when MemorialCare Health System announced it would close Community Hospital almost a year earlier than expected after finding the facility to be seismically unsafe. That announcement set off a scramble to find a new operator, along with several meetings among county and city leaders. Authorities estimated the closure would mean longer wait times for patients and longer drive times for ambulances. 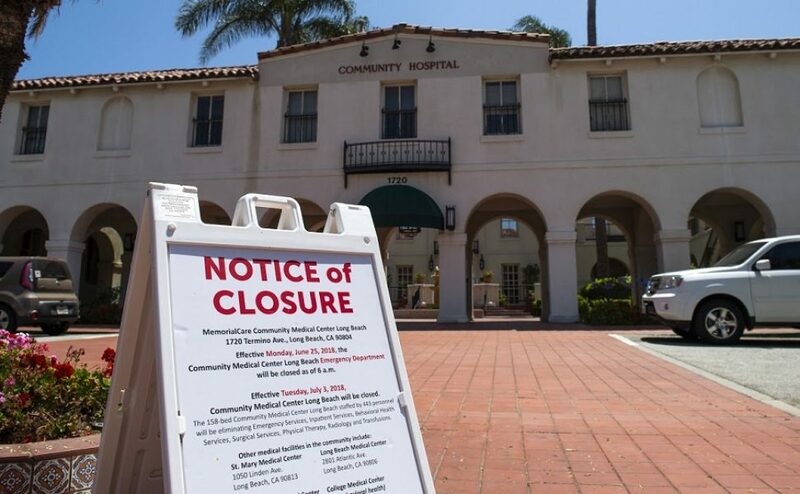 Community Hospital, which opened 94 years ago and housed East Long Beach’s only emergency room, closed its doors July 3 amid heated debate over whether it could be salvaged. MemorialCare, which had operated the facility for seven years, eventually agreed after tense negotiations with the city to keep its hospital license active so that a new operator could take over quickly. That still has not happened, though the city entered into an agreement with a new operator that includes John and Dr. Mario Molina, who formerly ran Molina Healthcare. The company, Molina, Wu, Network, originally planned to reopen the facility in January, but now says it is more likely to happen in the spring. The hospital plans call for an emergency room and about 40 beds. In the early morning hours of June 25, a fire crew from Long Beach’s Station 10 responded to a call at a high-rise senior apartment complex in Downtown Long Beach—an ordinary event for the busy station. Soon dispatchers spoke of “shots fired,” then rumors began circulating that a firefighter, possibly two, had been hit by gunfire. When Fire Chief Mike DuRee addressed the media at a press conference a few hours later, his voice broke with emotion: One of their own, Capt. David Rosa, 45, had been killed and another firefighter injured. In the aftermath, more than 8,000 people came to a memorial service on July 3 at the Long Beach Arena to honor Rosa, a 17-year veteran of the local department who left behind a wife and two sons. Firefighters across the state filled in at stations so his co-workers could attend the services. The city named its training facility after Rosa, a stretch of highway was named in his honor, and his name was engraved at a memorial at the state Capitol. The man accused of pulling the trigger, Thomas Kim, 77, died in custody on Aug. 3. He’d long suffered from diabetes. Authorities said Kim set off an explosion in his apartment aimed at killing himself and his upstairs neighbor, with whom he’d been feuding about noise. He had told authorities that when firefighters arrived, he had gotten scared and started shooting. 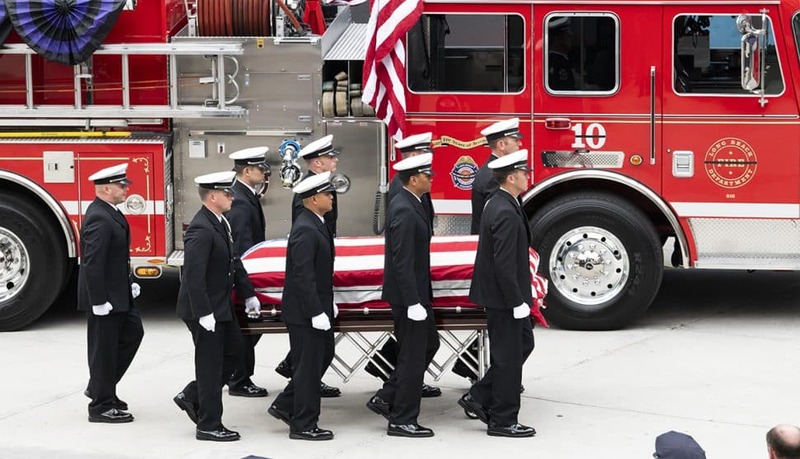 Ernesto Torres, the other firefighter who was wounded in the incident, served as a pallbearer at the funeral and presented Rosa’s wife with an American flag at the Sacramento ceremony.